Astronomy Through the Ages (starts at 4:10): If I ask you to close your eyes and imagine an astronomer, what do you see? Maybe you think of a lone figure hunched all night over the eyepiece of a telescope in a big, domed observatory. Maybe you think of Jodie Foster, as Ellie Arroway in the movie Contact, wearing headphones to listen in on cosmic radio waves at Arecibo. 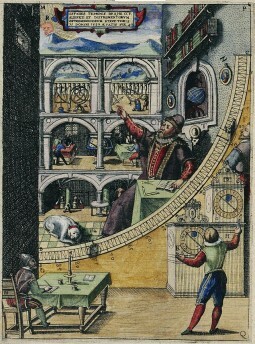 My mind always wanders back to a woodcut of Tycho Brahe’s 16th-century observatory, filled with intricate equipment for making naked-eye observations of the night sky. But do any of these ingenious images actually resemble the life of an astronomer today? And how are new technologies and “big data” changing the way we study stars today and in years to come? To discuss those questions, we’re joined in our Boulder studio by Dr. John Bally, a professor of astronomy at the University of Colorado, and Dr. Seth Hornstein, director of the Sommers-Bausch Observatory on the CU campus.